After the arrest of a business person in Tamil Nadu over a tweet he sent, there has been a huge uproar in the online world. The IT act has been used to, in effect, threaten Indians that should they say anything that ‘annoys’ (yes that part is in the act) someone, then they will be arrested. Can a court of law tell me what annoyance is? Point me to the section of our constitution that defines, not merely mentions, annoyance. There isn’t one because the ones who wrote our constitution were far better, smarter and more intelligent people than the ones who now sit and amend it with such abandon. How is one supposed to NOT annoy someone in a land where every film, every song, every statement, every action annoys some one or the other. I am constantly annoying, if not outright offending someone. I offend people because of what I say; I offend them by how I say what I say. My penchant for telling dirty cracks has offended some people so much that they have declared me to be disgusting and never spoken to me again. As an atheist and denier of god I offend huge swathes of fanatics. I will have to spend so much time going in and out of jail that they will probably just give me the keys and tell me to let myself out when I am done. Policemen in this country, by the way, are a voluntary association. These are free men who swore before an Indian flag to serve this nation and this people. Our money – tax money, pays them. THERE IS NO SUCH THING AS GOVERNMENT MONEY YOU IDIOTS. EVERYTHING, FROM THE CRAPPY ROADS TO THE POLICEMEN TO THE ‘FREE’ TV AND ONE KILO RICE, IS PAID FOR BY ME – THE TAX-PAYING PUBLIC. THIS IS ALL MY MONEY THAT YOU – THE ONE WHO BOUGHT THE VOTE, AND YOU – THE ONE WHO SOLD YOUR VOTE, ARE ALL LIVING OFF LIKE FATTED CALVES. Anyway, the point is that can I, the average middle-class genteel citizen that I am, go to a police station and complain that the local MLA is annoying me because he or she can never get around to actually building a road that lasts for six minutes once the rains start. Will I ever see these men (who I pay for), scramble out of their chairs and rush over to the MLA’s house to arrest him immediately? Never mind the MLA – how about the MLA’s son? Or brother? Or uncle? Or a friend? Or his wife’s brother’s wife’s cousin’s ex-school mate? What do I have? What can I do to be safe and not be harassed? My vote counts for nothing because my kind is easily overwhelmed in sheer numbers by the rest. I do not have the money to buy my changes, my laws, and my security. Laws are passed every day to suppress me, to make sure that I do not escape my cage. The laws telling me what NOT to do are pretty much just as intricate as the laws that make sure I DO the one thing I am good for – pay my taxes. Like cattle in a diary, every minute of my day is geared towards only two things – not letting me roam free and ensuring I am milked. The only thing I can do is endure and defy. It is pretty much the option of the gazelle when the lions are roaming. 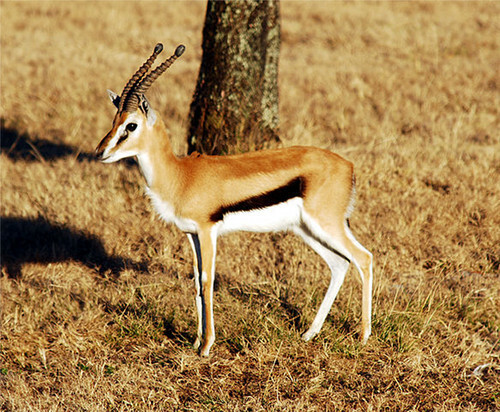 One gazelle, the meal of the day, is going to get eaten no matter what I do. So I may as well go out to graze and eat a full stomach of grass with my horns held as high as I dare. Every day that someone else is eaten, I can live with the knowledge that on this day, I did live, I did eat and I did what I wanted. One day I might be eaten, but others lived that day. And in the end, that’s all that matters. Now the lions may laugh at this gazelle-ish behavior. But those ‘kings of the jungle’ are going to be extinct WAY before than me. In the end, there are many gazelles, but only so many lions. There is precious little to do except try to increase number o gazelles!!!. Next time you meet your MLA, whom you any way annoy, you can tell him to get our constitution amended so that any body who goes to a police station should carry with him a certificate to the effect that the complainant is so and so of such such bigwig the man against the complaint is raised is not in any way relate to any bigwig!!!! !